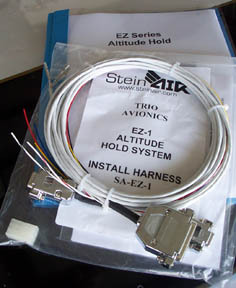 After a couple of hundred hours flying the superb EZ-Pilot autopilot from Trio Avionics, I eagerly anticipated the day when the talented and very clever fellows at Trio would introduce their altitude hold system. The release of the EZ Altitude Hold units coincided with the introduction of their very own Gold Standard servo. This servo is the most advanced unit available to the experimental market and has highly developed logic and mechanical safety features. Trio's website has an extensive overview of the various features of the EZ-2 and I don't see the need to rehash all of them in this article. Also on the Trio site is a link for downloading the manual for the EZ-2. What I will tell you is the unit performs exactly as advertised.The various safety features such as the programmed airspeed limits and constant oversight by the system of the servo loads is impressive and unique to the Trio design. I hesitate to call this device merely an "altitude hold" since it does far more than accurately maintain altitude. The EZ-2 vertical autopilot is a superb complement to the EZ-Pilot wing leveler and provides tremendous capability in a reasonably-priced system. As a point of reference, I had been flying the TruTrak AlTrak altitude hold in my RV-6 for a few years and found it to be an excellent unit. However, it is just.....an altitude hold. The EZ-2 will not only perform the altitude hold duties, but will also climb/descend at a selected rate or airspeed. Very accurate fine adjustments (5' resolution!) can be made to the selected altitude, and foremost in my opinion is the ability for the pilot to access all programming parameters of the EZ-2 while in flight. This allows the pilot to not only tailor the characteristics of the unit to his/her particular aircraft, but also affords the opportunity to quickly change flight characteristics to best suit various levels of turbulence if desired. The addition of the EZ-Pilot to N399SB was facilitated by the excellent wiring harness custom-built by Stein-Air. This is available at modest cost through Trio Avionics and should work well with any EZ-2 installation. The Trio Gold Standard servo looks similar to the venerable Navaid unit but has features the Navaid could only dream about. Fortunately the ease of installation and light weight of the old Navaid is retained and Trio furnishes an aircraft-specific bracket for the servo. 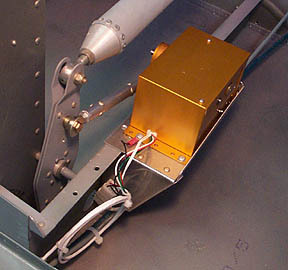 In the RV-6 and similar RV's, the servo easily mounts on the rib carrying the elevator bellcrank, and the supplied short pushrod attaches to the bellcrank with supplied hardware. I was pleased to see that Trio furnished large-area washers to secure the rod-end bearing to the servo arm and bellcrank. Pins are already attached to the Stein-Air harness and they are popped into the supplied Molex plug after the harness is snaked through the floorboards of the plane. 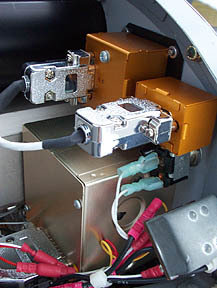 Unlike the servos on some other autopilot systems, the Trio servo geartrain completely unlatches from the control system of the aircraft when the servo is unenergized. Not only is this a valuable safety feature, it also eliminates any drag in the system when the autopilot isn't running. The servo has a clutch which is easily overpowered by the pilot when the servo is activated in case an emergency requires quick intervention by the pilot. I mounted the triangular brace at the forward end of the servo tray but it might offer more rigidity to the tray if it was mounted at mid-span. However, my installation apparently is rigid enough since the system works superbly. Note: This photograph shows the servo pushrod mounted to the bellcrank in a less than optimum location. I originally used the same hole in the bellcrank I had earlier used for the AlTrak installation, but later relocated the pushrod closer to the bellcrank pivot as suggested in the Trio manual and found out that.........the Trio guys know what they are talking about! Look closely and you can see the recommended hole just below the rod-end bearing. 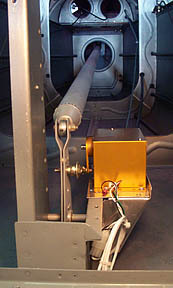 The system gain and deadband was much more readily optimized with the pushrod located as specified in the EZ-2 manual. Since the EZ-2 is capable of climbing/descending at a set airspeed, and also in order to use the airspeed safety features, the processor must be connected to the pitot and static lines. I mounted the processor on a piece of angle that was attached to the rudder pedal support brace so I would have a short run to the pitot lines. The box must be mounted in the proper orientation since it contains among other clever stuff an accelerometer which alerts the system and commands it to disengage if it is seeing too high a G-load. Once again the Stein-Air harness made short work of getting the electrons pointed in the right direction. 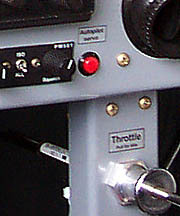 Very little panel space is required for the controls for the EZ-Pilot. This is good because the flight-instrument portion of the panel on N399SB has very little acreage! Trio can supply a variety of bezels for the switch and encoder so most any installation can be accommodated. 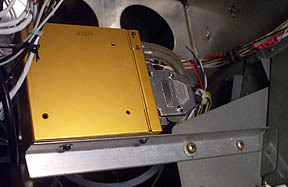 The two boxes at the top of the photo are the LCD switch and rotary encoder. You might notice the switch I installed just under the encoder which allows power to be disconnected from the entire system. The LCD switch is a really neat device that not only activates the system but annunciates messages as the unit steps through its paces or if there is a need to alert the pilot to some unusual control system activity. Update: The EZ-2 is designed so you can have a momentary switch on the panel or control stick so the unit can be either instantly disengaged or switched into Pilot Command Steering (PCS) mode. PCS is engaged by holding down the switch for ~three seconds and when the switch is released, the system will hold the climb/descent rate that is present when the switch is released. 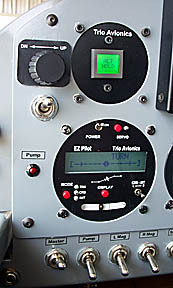 The EZ-Pilot has the same mode (when entered the plane will fly the present heading when the switch is released) and I had installed the switch for the EZ-Pilot. It turns out the same switch can be used for both units and offers an interesting option. Not only will pressing the switch disengage both systems simultaneously (convenient for entering a traffic pattern) but when the switch is held down, both the EZ-Pilot and EZ-2 will enter PCS mode! This means you can hold down the switch, manually fly the plane into a new heading and/or climb/descent rate, release the switch and the systems will capture the new heading and/or rate. I have the red switch mounted on the panel adjacent to the throttle so I can easily reach it with one finger of the throttle hand. Update: I have now upgraded to the EZ-3 version of the Trio altitude hold system. The EZ-3 has all the features of the EZ-1 and EZ-2 plus the ability to climb/descend to a preselected altitude. The unit also has a feature that allows you to sync the sustem to the barometric altitude so you can have the device seeing the same altutudes as your altimeter. The system works exactly as advertised and captures preselected altitudes superbly. All in all, I am very impressed with the EZ family of altitude hold systems. The ability of the system to maintain altitude is superb, and the pilot can easily program the unit to provide the degree of aggressiveness wanted for a particular aircraft or pilot preferences. It took me about five minutes to get spoiled to letting the EZ-2 fly climbs and descents in the RV-6 (I know, the RV is a great plane to yank-n-bank, but it is also fun to make nearly an entire flight without touching the control stick!). The unit provides what the Trio guys promise, and based on my experience with the device and the exemplary support from Trio, I highly recommend the EZ sytems.